The asterisk is usually used to call out a footnote in a paper, but this time the asterisk is being used as a way to relax and taste wine on a floating island in Beijing. Japanese architect Keiichiro Sako, Founder of Beijing based SAKO Architects, has built a poetic new 22,000 square foot winery in the shape of an asterisk on the outskirts of Beijing. The new establishment, which is titled Asterisk Winery, has been constructed for hospitality group Park Hotel Management Ltd. The steel structure is finished with Selangan Batu timber, a yellow brown, reddish brown, and sometimes purplish brown timber that darkens with age.Five-prawns reach out from the central multifunctional space of the winery, segregating the prawns into private spaces, where weddings and ceremonies can be held. Only one road has access to the Asterisk. The road crosses over the lake with a small bridge upon appraoching the winery, allowing cars to drop guests off at the loop driveway closest to the lobby. 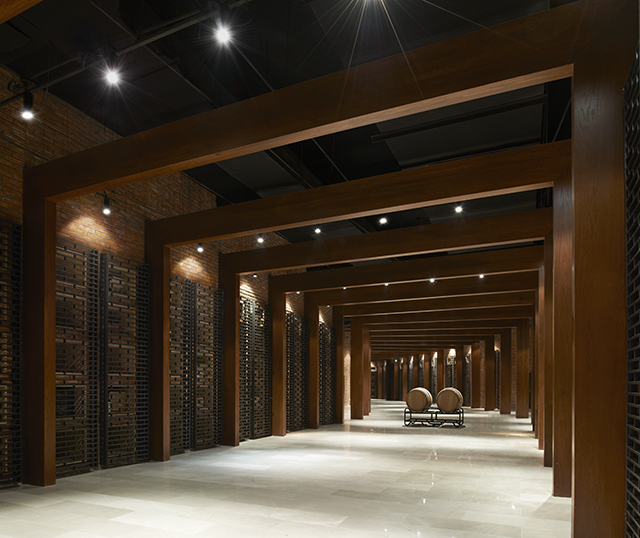 On the property, Sako designed a wine showroom, an indoor/outdoor restaurant, underground winery, basement, lobby, and the central multifunctional space. The highest point of the Aluminum plate roof is in the center of the Asterisk, then the roof slopes down towards the five tips of the asterisk prawns - giving the structure more of a starfish shape, than the shape of a 3 dimensional asterisk. Inside, creamy white walls become the canvas for minimalistic furniture and a captivating sprawling timber roof. Some of the asterisk prawns have wooden terraces that overlook the curvy lake, providing guests with quiet spots to taste wine and an opportunity to show off Beijing's stunning countryside.